The man to the left is Lubomir Visnovsky. He was dealt to the Islanders in the off-season before the NHL lockout began, and he fought the trade thinking that his no-trade clause that he signed in Edmonton could be invoked. Unfortunately, that's not how the NHL and its contractual obligations work, so Visnovsky was informed that he would need to report to the Islanders for this season. With the lockout, Visnovsky found work in the KHL closer to home, and it appeared he was prepared to join an up-and-coming Islanders squad. 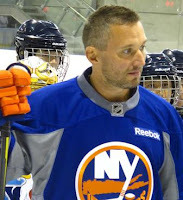 When the lockout was over, however, Visnovsky decided that it would be better if he remained closed to family in Slovakia, opting not to return to North America, the NHL, or the Islanders. This, of course, would cause a major rift between the NHL and KHL, so the KHL wisely suspended Visnovksy's KHL contract with Slovan Bratislava, making him ineligible for any further games. With no hockey to play, he insisted he must remain in Slovakia for family reasons. The Islanders suspended him for not reporting, essentially putting him out of hockey until he resolved this issue with the Islanders. Today, however, Visnovsky's agent, Neil Sheehy, reported via Twitter that the defenceman would join the Islanders "no later than Feb 11th, possibly sooner, due to personal medical reasons within his immediate family". While I appreciate the importance of family and how medical problems within his family could require his attendance, Visnovsky has gone about this entirely wrong. So the question needs to be asked: when Visnovsky returns on February 11 or sooner, would you dress him as part of your team, or would you simply tell him to remain at home and keep him suspended? On one hand, you can certainly use a defenceman like Lubomir Visnovsky if you're the Islanders. He's a strong veteran presence with good puck skills, and he can be relied on to log a pile of minutes in both zones if necessary. He pick up 30-40 points if things go well, so he can certainly contribute from the back end, and has only been a minus player in five of twelve seasons. Then again, the Islanders have a number of solid, young defencemen that could use those minutes to improve for upcoming seasons. While it's always nice to pick up another veteran defenceman, the kids can use the seasoning to make them better. Visnovsky would arrive with 37 games to play - still three-quarters of the season - but, depending on the Islanders' record after those 11 games - it might be better to go with the status quo based upon chemistry and ability. I'm sure that the Islanders will certainly welcome a veteran player like Visnovsky in, and it should be of benefit in terms of his play in the KHL while being locked out. I'm not sure that I would be comfortable as a player with him strolling in mid-season, but management is responsible for putting the best team on the ice and I would assume that Visnovsky will help. If I'm Neil Sheehy, however, I'm telling my client to make the "possibly sooner" a reality in order to make things nice with the Islanders and, by extension, the rest of the NHL.